Strict austerity policies (government spending cuts and higher taxes) have been the main lever used to try to reverse soaring debt loads in many so-called “peripheral” European countries. This approach has been pushed by the economically stronger eurozone members in the North (particularly Germany) and the International Monetary Fund. But exhaustion with this strategy — sometimes labeled “expansionary fiscal contraction” — has been building, and it is increasingly viewed by many as a failed effort because it has crippled growth and fueled more unemployment. Deep public spending cuts have led to a drop in private spending, all of which have become a huge drag on eurozone economies and pushed several countries — including Spain, Italy, the United Kingdom, Portugal and Greece — into double-dip recessions. What’s more, the resulting economic slowdown has slashed government revenues, making it more difficult to hit budget targets and actually worsening the debt burden in some cases — exactly the opposite of the intended effect, critics note. A pushback against austerity has been building for some time. But the clearest measure of it came with Hollande’s victory in the May 6 election, making him France’s first Socialist leader in almost two decades. But that was just one recent straw in the wind. Other political developments showed a strong backlash against austerity: The Dutch government, which heavily favored austerity, collapsed; U.K. Prime Minister David Cameron’s Tories — supporters of strict austerity — were beaten badly in Britain’s local elections; German Chancellor Angela Merkel’s CDU party barely eked out a victory in local elections, and Greek voters elected candidates who opposed austerity measures from far right and far left parties, rebuffing the pro-austerity middle. Enter President-elect Hollande, who is recasting the European austerity debate. “Hollande can shift the balance of opinion among Europe’s leaders and put pressure on Germany to see the light,” Guillen notes. “Merkel is also under pressure. The solution has to be through the ECB (European Central Bank) and the potential issuance of eurobonds. Also, the surplus economies (e.g., Germany) should reactivate and spend more so that other countries can export to it.” Hollande has recommended that the ECB lend directly to governments, rather than lending to prop up Europe’s many weak banks. There are signs that at least some quarters of officialdom are turning to new directions. Some top European officials — including Olli Rehn, the European Union’s leading economic official — in early May were calling for more government spending on large infrastructure projects to offset weak private sector spending and to create more jobs. Rehn also wants more funding for the European Investment Bank, including eurozone bonds, to fund these projects. Other officials, including Hollande, say they want to water down austerity measures by stretching out the timeline for reaching healthier budget goals. And even in Germany there were calls for some stimulus measures, at least within the country. Germany’s finance minister, Wolfgang Schauble, recently announced support for substantial wage increases for German workers, in part to increase consumer spending, which would also flow to the troubled European economies via German imports. Eventually, attention is likely to turn back to Spain’s severe debt problems, given the importance of its economy within the eurozone. In one sign that the situation continues to deteriorate there, just after the French election, Spain announced it would bail out the country’s third-largest bank (by assets), Bankia. That was a sharp reversal of Spain’s earlier position, in which it claimed it would no longer use federal funds for bank bailouts. How will Spain fare with its debt in the end? 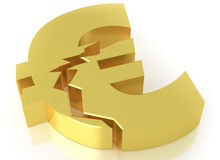 Wharton finance professor Franklin Allen predicts that the country will likely choose to work with the European Financial Stability Facility or the European Stability Mechanism — two related eurozone bailout funds — because it would be more palatable for political reasons. But from a strictly economic viewpoint, Spain would do better by offloading the debt now, Allen says. He points out that if Greece had defaulted in May 2010, they would be “much better off” now. But if Spain starts to substitute more public debt for existing private bank debt, as it has done with Bankia, it will become much more difficult for the country to manage a debt default that could be required to salvage the economy. Allen also believes that Spain my still need to weigh leaving the eurozone — at least temporarily — if it wants any chance of being able to grow strongly. There has also been much speculation that Greece might eventually leave the eurozone, either temporarily or permanently, as well. But “if Greece were to exit, it may not be interested in coming back in,” says Wharton management professor Witold Henisz. Those policies could involve financing economic stimulus measures with eurobonds or directly through the ECB, making the ECB a lender of last resort, something that many observers say could be a key component of any final resolution of the eurozone’s problems. Germany has vigorously opposed both approaches up until now, because it would mean allowing other eurozone countries with large debt burdens and low credit ratings to piggy-back on Germany’s bullet-proof credit rating. That has the potential of dragging Germany’s rating down and increasing the costs for the country to fund its own debt in the bond markets. Germany also sees such “mutualization” of debt as a moral hazard that would take away the incentives for high-debt countries to patch up their budgets in the short term. But even if Hollande were to gain such an advantage in eurozone negotiations, any changes on the debt financing front would have to be accompanied by real reforms of labor laws, in countries such as Spain and Italy, in a way that would reduce the barriers that now discourage employers from hiring workers as readily as they do in other industrialized countries, Henisz says. Such reforms would also include reduced pension and other social welfare benefits.